Francis Pegahmagabow (1889–1952), an Ojibwe of the Caribou clan, was born in Shawanaga First Nation, Ontario. Enlisting at the onset of the First World War, he served overseas as a scout and sniper and became Canada’s most decorated Indigenous soldier. After the war, Pegahmagabow settled in Wasauksing First Nation, Ontario, where he married and raised six children. He served his community as both Chief and Councillor and was a founding member of the Brotherhood of Canadian Indians, the first national Indigenous political organization. In 1949 and 1950, he was elected the Supreme Chief of the National Indian Government. Francis Pegahmagabow’s stories describe many parts of his life and are characterized by classic Ojibwe narrative. They reveal aspects of Francis’s Anishinaabe life and worldview. Interceding chapters by Brian McInnes provide valuable cultural, spiritual, linguistic, and historical insights that give a greater context and application for Francis’s words and world. Presented in their original Ojibwe as well as in English translation, the stories also reveal a rich and evocative relationship to the lands and waters of Georgian Bay. 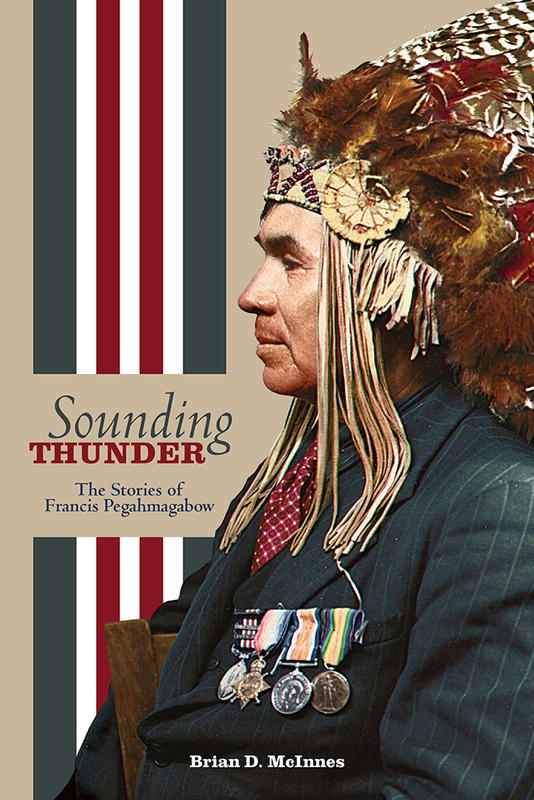 In Sounding Thunder, Brian McInnes provides a new perspective on Pegahmagabow and his experience through a unique synthesis of Ojibwe oral history, historical record, and Pegahmagabow family stories. Brian D. McInnes is a professional educator and author dedicated to diversity education, youth engagement, and organizational leadership. He is also a member of the Wasauksing First Nation and a descendant of Francis Pegahmagabow. —Brock Pitawanakwat, Assistant Professor, Department of Indigenous Studies, University of Sudbury. —Margaret Ann Noodin, Assistant Professor, Department of English, University of Wisconsin.